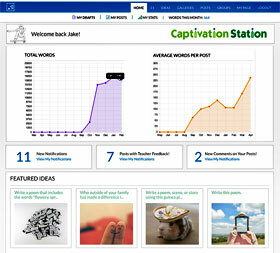 We are thrilled to announce WriteSteps has partnered with Write About to create CaptivationStation! 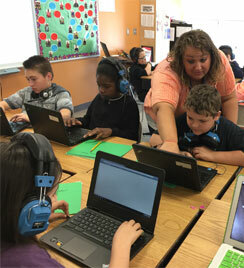 CaptivationStation is a first-of-its-kind blended learning platform where 3rd-5th grade students can receive their standards-based writing and grammar instruction through videos called Captivators. It’s truly a game changer for classroom teachers! We are proud of the Captivators, developed by the amazing Ms. V, a.k.a. Joanna Van Raden, whose likeness is captured in the video button image to the right. Captivators are the writing and grammar instructional videos found in CaptivationStation. They are available in every CaptivationStation lesson and can be viewed whole group, small group, or individually, in order to meet different teaching and learning styles. We learned of the success Joanna had experienced with her students after she created her own blended writing and grammar videos based on WriteSteps lessons. 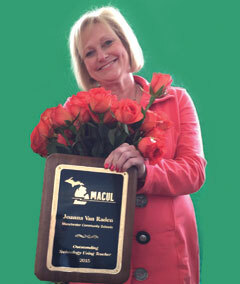 So, we approached her with the idea to help us develop the student instructional videos in CaptivationStation. The result is truly amazing! Read on for Joanna’s story that inspired the creation of Captivators. log in to their personal homepage for more engagement in and ownership of the writing process (single sign-on for Google users). 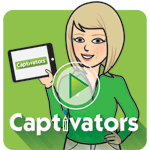 watch daily, standards-based, writing and grammar instructional videos called Captivators. complete the lessons anytime, anywhere, on any device, making it easy for absent students to catch up on missed learning. read and listen to daily audio instructions, which helps all types of learners, including ELL and special education students. write digitally with easy-to-use tools, which prepares them for online writing assessments. read and listen to teacher feedback and apply it to develop their writing skills. decide whether Captivators are viewed in whole group, small group, or individually, for flexibility of different teaching and learning styles and to work with the technology available in each classroom. decrease classroom management problems with engaging instructional videos and step-by-step independent practice that motivates even the most reluctant writers. spend more time in individual and small group conferences because students receive their instruction through the Captivators and online writing practice. save time and help students develop their writing skills by providing typed or recorded audio feedback. monitor student progress and data through dashboards, providing information to personalize and differentiate instruction to better meet the needs of each student. collect and share student writing and progress data with administrators and parents, making it easy to measure and evaluate outcomes. when gone, have the confidence that writing and grammar instruction is taking place even in their absence because a substitute can show Captivators to introduce new content. share student accounts for co-teaching or to another user in the district, allowing multiple educators to interact with a student and their work, for easier accessibility and increased accountability. use the Student Transfer Tool, allowing the student’s writing portfolio to travel with them each school year and between teachers to inform and influence instruction. re-assign teacher and student accounts, making it easy to accommodate enrollment and staffing changes that occur throughout the year. review analytics about writing engagement across students, classes, and grades, helping districts monitor implementation fidelity. Click here to learn more about CaptivationStation and to see it in action!